In order to fully understand and appreciate advanced probability, analysis, and advanced mathematical statistics, a rudimentary knowledge of measure theory and like subjects must first be obtained. The Theory of Measures and Integration illuminates the fundamental ideas of the subject-fascinating in their own right-for both students and researchers, providing a useful theoretical background as well as a solid foundation for further inquiry. Sections conclude with exercises that range in difficulty between easy "finger exercises"and substantial and independent points of interest. These more difficult exercises are accompanied by detailed hints and outlines. They demonstrate optional side paths in the subject as well as alternative ways of presenting the mainstream topics. In writing his proofs and notation, Vestrup targets the person who wants all of the details shown up front. 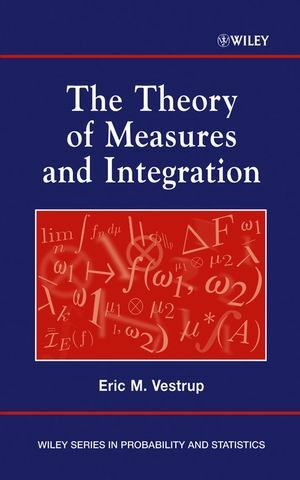 Ideal for graduate students in mathematics, statistics, and physics, as well as strong undergraduates in these disciplines and practicing researchers, The Theory of Measures and Integration proves both an able primary text for a real analysis sequence with a focus on measure theory and a helpful background text for advanced courses in probability and statistics. ERIC M. VESTRUP received his masters and doctorate in statistics from the University of California at Davis. He was awarded the Chancellors Teaching Fellowship prize from UC Davis in 1997 for outstanding promise in the field of teaching. He has published in the areas of mathematical statistics, decision theory, and analytic philosophy, and is currently an assistant professor at DePaul University. 7. Integrals Relative to Lebesgue Measure. 10. Products of Two Measure Spaces. 11. Arbitrary Products of Measure Spaces.